Lately we’ve been seeing a lot of images of women and girls, both old and young participating in protests and clashes with the Israeli Occupation Forces. A lot of people including myself, inspired by our peoples’ valiant resistance, have been sharing these images online and talking about them with friends and family. But I read a comment recently that suggested that this was a new phase in Palestinian struggle, as if women were just now joining these confrontations. But Palestinian women have always been on the frontlines and it would be dangerous to forget this. I would like to speak to you all today about the history of women in Palestinian resistance, the fighting legacy our generation has inherited and why it is important we continue this legacy both here in the U.S. and in Palestine. I will start from the beginning both because our history is inspiring and because I want to make sure we all understand that women’s involvement in this movement is not a new phenomenon. Let’s begin with the first phase of colonization in Palestine, the British Mandate. In his book about the village of Baqa al-Gharbiyeh, the Palestinian historian Subhi Biyadseh recalls an event the villagers told him. 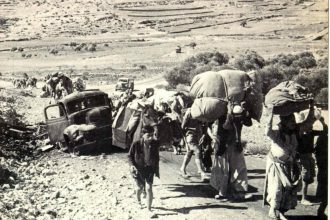 During the British Mandate era in Palestine, the English shelled the village of Baqa al-Gharbiyeh in 1936. The army then took all of the men of the village prisoners. The women responded by descending upon the military barracks at night with their children, armed only with rocks, demanding the army’s release of their men, which they succeeded in achieving. This short story highlights the prominent role Palestinian women have engaged in when it comes to resistance against the foreign occupation of Britain and then Israel. During this time armed women’s organizations also existed, such as Zahrat al-Uqhawan, which was originally established as a social organization in 1933 in the city of Yafa by the two sisters Moheeba and Arabiya Khursheed. The transformation into an armed group was a consequence of Moheeba witnessing a British Mandate sniper shoot a Palestinian boy in the head as he lay in his mother’s arms. Zahrat al-Uqhawan were involved in fighting the Zionist armed gangs up until Yafa fell in 1948, when some of the city’s Palestinian population were ethnically cleansed, including Moheeba, who lived out the rest of her life as a refugee in Jordan. After the catastrophe that was 1948 and the establishment of Israel, many more heroines emerged. Hayat Al-Balbisi, a teacher in Deir Yassin, and Hind Al-Husseini are only two examples out of thousands. Hayat Al-Balbisi was in Jerusalem the day of the Deir Yassin massacre, but the minute she heard news of an attack on Deir Yassin, she rushed to help. She was a Red Cross worker and so in Deir Yassin, 15 girls and boys took refuge at the school with Hayat. She turned the school into a rescue center and placed the sign of the Red Cross on the door, thinking that this way she could protect the children and the wounded because the Zionists would respect humanitarian law and not attack a Red Cross center. But the sign didn’t help her cause. Eighteen-year-old Hayat was shot dead by Zionist terrorists, while helping an injured Palestinian. The 55 children that did end up surviving the massacre were paraded around neighboring areas like war trophies and then dumped in the Old City where they were found by Hind Al-Hussieni. She took them to her family’s mansion “Dar Al-Husseini,” which she renamed “Dar Al-Tifl Al-Arabi,” or Arab’s Children’s House. Hind Al-Husseini dedicated her whole life to the orphans of Deir Yassin and other Palestinian children, cared for them and provided them with an education. Today, the mansion houses a school, a museum for Palestinian folklore and art, and a library on research and the Arab heritage of Jerusalem. These two examples show the dynamic ways in which women can be involved in struggle, both directly and indirectly. 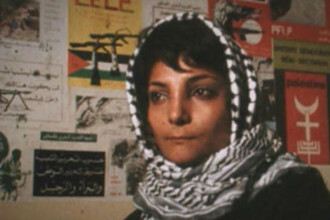 One example of a woman who has struggled directly against Israeli occupation is of course, Leila Khaled, a member of the Popular Front for the Liberation of Palestine. She became the first Palestinian woman to hijack a plane in 1969, and again the year after. Her iconic photograph, the picture which made her the symbol of Palestinian resistance and women’s power, is one that every Palestinian girl knows well. She not only carried out one of the most controversial attacks of her time but she was also the first female member of the Popular Front for the Liberation of Palestine (PFLP) in 1967 and remains a member in the PFLP Leadership Council today. I mention her specifically because I remember reading her autobiography and feeling, inspired by her story. What really resonated with me was the need for organization in order to defeat the colonial enemy. Then in 1987, when the first intifada broke out, the Women’s Work Committee was founded. The uprising spurred these women to work for the national cause in a situation of real emergency. A Nablus activist explained the situation as such: “Because our program [before the uprising] was explicitly political, economic, and cultural, women were afraid to join, But during the uprising, our program began to address reality. Now women were more eager to join, because they wanted to address problems in their real lives.” They extended the schedules of child care centers to accommodate women active in the uprising, and provided health education classes and first aid as casualties mounted in the neighborhoods, especially in response to beatings and tear gas. Women also distributed leaflets, discussed politics openly, and urged people who remained unconvinced to participate in the uprising. This is what I mean by organization: becoming part of a group that actively engages the community and uses specific tactics to do so. As we just mentioned, the first Intifada opened the way for a flood of grassroots popular resistance to the violence of the Israeli occupation. Yet while the women’s role in the Intifada was recognized as crucial, they were not involved in political decision-making processes, which is the next step in organizing and being involved politically. The signing of the Oslo Accords in 1993 calmed relations with Israel, ended the popular uprising, and conceded national principles of self-determination, liberation and justice in exchange for a promised consolidation of political and economic power. Although women had been active in non-governmental organizations and direct “combat”, female participation in the newly formed Palestinian Authority (PA) government was weak and marginalized. Their job opportunities were limited to those of secretaries, typists, or teachers in public schools. Women are still underrepresented in the leadership of the main Palestinian political parties, including Hamas, despite high levels of political activism. Palestinian women have always been an integral part of the Palestinian struggle for freedom and liberation. They have always been men’s partners in resistance and in fighting Zionist occupation and colonization, whether as villagers, as workers, as teachers, as activists or as freedom fighters. The Palestinian history of resistance is full of names of heroines, activists who refused to remain silent or inactive while Palestine was being colonized. But in addition to the many names that are recorded in Palestinian history, there are the thousands and thousands of unnamed heroic women, the activists and the fighters whose names we will never know, but who will always be part of us because they are our grandmothers, our mothers, our sisters, our friends and our comrades. And that’s also an important point to make. We don’t do this for the fame or the protest photo; we struggle because our lives depend on it. Last summer we witnessed one of the most brutal attacks on Gaza and the Palestinian people as a whole. 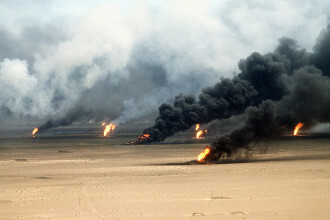 More than 2,100 people were killed, more than 11,000 injured and 100,000 homes were destroyed. Israel’s one-sided war on the Palestinian people was not an accident. It was not because of three kidnapped boys and it wasn’t because of Hamas. Israel’s attacks were a war on women. Their offensive war was genocidal and targeted women and children in an attempt to eventually ethically cleanse the entire Palestinian population. And while that is true, the siege-manufactured poverty has led 80 percent of Gaza’s 1.6 million Palestinians to be food-aid dependent and has caused increasing rates of malnutrition and anemia in women. A joint report by Medical Aid for Palestinians and Save the Children noted that anemia affected 36.8 percent of pregnant women in Gaza and that anemia can result in “poor pregnancy outcome, and contributes to 20 percent of all maternal deaths.”The forces of occupation purposely sustain high rates of miscarriages by blocking basic resources such as water and medical supplies, forcing women in labor to wait at military checkpoints on their way to a hospital, and generally creating inhumane and unlivable conditions for Palestinians. Despite the countless deaths and destruction caused, as well as the intensifying hate speech in mainstream Zionist politics, all U.S. Senators unanimously passed Senate Resolution 498 to give full support to Israel’s actions. The United States government gives Israel over 3.1 billion dollars EACH year in “aid.” Israel uses that money for its military and industrial development and building settlements on stolen land. Hillary Clinton, a so-called feminist and a Democratic presidential candidate, recently stated that if elected she would reaffirm the unbreakable bond the U.S. has with Israel and Netanyahu.This is why it is so important for us to stand up against the hypocritical political claims of the U.S. government. Clinton has made a point to publicize her support of women’s issues as being at the core of U.S. foreign policy. She has visited states all over the world, from South Africa to the Democratic Republic of Congo, talking to survivors and condemning systematic violence against women. But while she addresses these issues, she simultaneously advocates for policies that directly oppress women. As mentioned, Clinton is an outspoken supporter of Jewish settlements in the West Bank, which seek to grab more and more land from the Palestinians. Clinton’s support of Jewish settlements in the West Bank exposes the gaping holes in her advocacy for rights for all women because it demonstrates how narrow, selective, and oppressive her “feminism” is. By supporting imperialism, she is perpetuating white supremacy and colonization. It is our duty as Palestinian women, but more importantly as citizens of this country, to dismantle this system of contradictions. We must demand an end to war and occupation because without our voices being heard, women like Hillary Clinton will be the only ones heard. One thing I’ve always been proud of pointing out, and I think it’s important to, is that in Palestine the lines aren’t only blurred when it comes to men and women’s place in the struggle but also Muslims and Christians. Palestinians of course include both Muslims and Christians, and Christians are being just as persecuted as the rest of us. Israel has a long history of burning and vandalizing Christian schools, churches, and institutions. Christians also have to spend hours at checkpoints and are subjugated to the same violence. There is no clearer example than Bethlehem, the place of Jesus’ birth. We must continue to be united in every avenue of our lives if we want our movement to succeed. Whether that’s men and women, Christians and Muslims, or even across race and ethnicity. The past year has been one of high-profile growth for Black-Palestinian solidarity. Out of the terror directed against both of our communities, strengthened resilience and joint struggle have emerged between our movements. That must continue. We cannot win our fights without solidarity and a willingness to fight side by side. That’s the first point of organizing. Second, as we know, without massive uproar from us, U.S. taxpayers will continue bankrolling Israel’s oppression of Palestinians. We must continue to be part of movements in the streets and on our campuses, and we must continue to boycott Israeli goods. Every progressive gain in this country and abroad has been due to the popular movements that pushed these issues to the forefront. Things like the 8 hour workday, women’s right to vote, civil rights for African Americans, and gains in immigration. The one example that mirrors Palestine the most is South Africa. International isolation, internal resistance, a formidable underground movement and an armed resistance, which combined brought the end of the Apartheid system in South Afric–all are factors that should be kept in mind when talking about a platform for a solution to the Palestinian question. The pressure that was put on the leaders of this country and even celebrities to stop supporting the Apartheid system is exactly what is going on now in the Palestinian movement. We cannot win this alone. We must organize and we must unite. I myself am a Palestinian refugee and I cannot tell you how integral it’s been to my life to have joined an organization like ANSWER, one that was on the forefront of the anti-war struggle just days after 9/11 when there was mass hysteria and anti-Muslim bigotry everywhere. When I was forced to move back here in 2006, I thought I hated this country, I thought I hated everyone in it. But then I found like-minded people who saw Palestine and the anti-war movement as an important aspect of not only my personal liberation but the liberation of all humanity. The citizens of this country don’t want the majority of their budget to go to war and the occupation of people around the world; they want education and jobs and housing right here in their own country. And so when I found a group that is multi-national and serious in their struggle against all forms of oppression I knew I had to join them. Joining an organized group not only gave me a platform for my voice to be heard but one where I can engage in the direct progress of this country. It is our right and our legacy to struggle against a government that does not meet our needs, that’s what democracy means right? As we know, there is only one viable solution to Israel’s occupation and that is simply ending it. But not just ending it, dismantling it. A single and secular state in all of historical Palestine, which does not mean the borders of 1967, but all of it from the northernmost part to the southernmost, from the river to the sea, is the only solution for Palestinian freedom. And so, sisters, get active, get involved because just like our sisters before us, it is our duty and our right to fight for our survival as a people. Thank you.